DIRECTOR OF SPLICE INSTITUTE. EDUCATOR. PROGRAMMER. 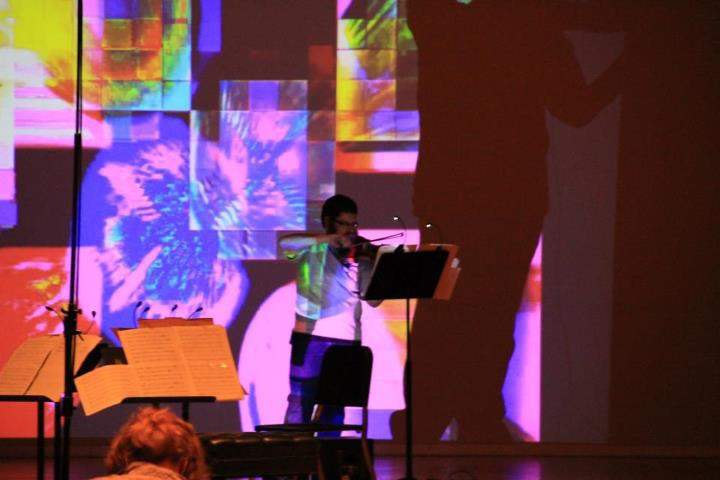 Christopher Biggs is a composer and multimedia artist residing in Kalamazoo, MI, where he is Associate Professor of Music Composition and Technology at Western Michigan University. Biggs’ recent projects focus on integrating live instrumental performance with interactive audiovisual media. Biggs is the Director of SPLICE Institute. His first album, Decade Zero, was released on Ravello Records in the fall of 2017.
will all fall in for vibraphone and interactive electronics has been commissioned by Scott Deal. The work is inspired Jeff Lemire’s graphic novel “A.D. : Afterdeath.” The work will be performed in Beijing and Indianapolis in Fall 2019. The live electronics consist of 8 processing units, each of which can be automatically mixed based on the amplitude of any other set of signals. Transduction for saxophone with thunder tube insert and interactive audiovisual electronics is being written for Noa Even, Justin Massey, Henning Schröder Zach Shemon, and Drew Whiting. The work is inspired by the idea that all perception is transduction of energy and that are perceptions are what binds us together. Noa Even will premiere the work in September of 2019. Christopher Biggs is a composer and multimedia artist residing in Kalamazoo, MI, where he is Associate Professor of Music Composition and Technology at Western Michigan University. 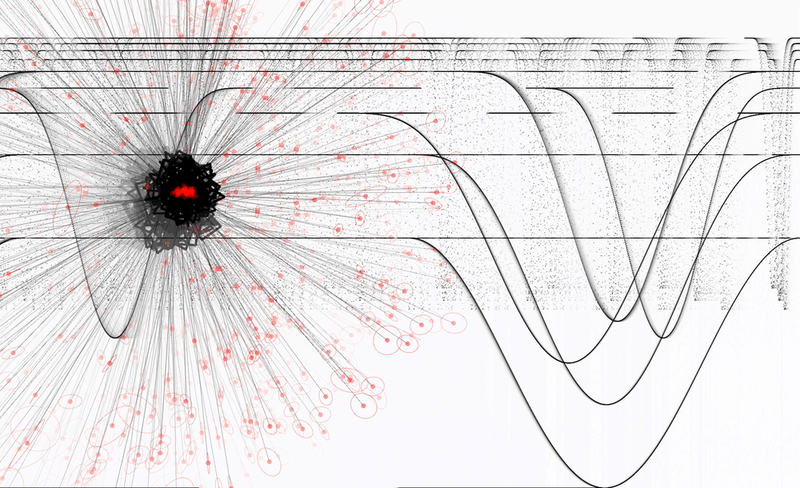 Biggs’ recent projects focus on integrating live instrumental performance with interactive audiovisual media. Biggs’ music has been presented across the United States and Europe, as well as in Latin America and Asia. His music is regularly performed on conferences and festivals, including the International Computer Music Conference, SEAMUS Conference, Visiones Sonoras, Electronic Music Midwest, Electroacoustic Barn Dance, Root Signals, New York City Electroacoustic Music Festival, Toronto International Electroacoustic Music Symposium, Bowling Green New Music Festival, and Society for Composers, Inc.
His music is available on Ravello Records, SEAMUS CD Series, PARMA Recordings, Electroacoustico Records, Thinking outLOUD Records, and Irritable Hedgehog. Biggs has written music for various ensembles, including Ensemble Dal Niente, the Western Brass Quintet, the Prism Saxophone Quartet, SPLICE Ensemble, Keith Kirchoff, Pangea Piano Project, Kari Johnson, Samuel Wells, Western Michigan University Symphonic Band, and the Truman State University Wind Ensemble. Biggs is a co-founder and the director of SPLICE Institute, which is a weeklong intensive summer program for performers and composers to experience, explore, create, discuss, and learn techniques related to music for instruments and electronics. SPLICE takes place each June in Kalamazoo, MI. Biggs received the 2008 Missouri Music Teacher’s Association composer of the year award, the 2009 SEMAUS/ASCAP first place award, the 2011 MACRO International Composition Award, the 2012 Issa Music and Dance Faculty Award, a 2013 and 2016 Kalamazoo Artistic Development Initiative Grant, and various grants and awards from Western Michigan University. He was a Preparing Future Faculty Fellow at the University of Missouri-Kansas City from 2007 to 2010. Biggs has given guest lectures at numerous universities, including Indiana University, the University of Missouri-Kansas City, University of Missouri, and Columbia College. He was a co-founder and board member of the Kansas City Electronic Music and Arts Alliance. Biggs teaches acoustic and electronic music composition, electronic music production, digital signal processing, visual programming, and music theory. He received degrees from American University (B.A. in print journalism), The University of Arizona (M.M. in music composition), and the University of Missouri-Kansas City (D.M.A. in music composition). He studied music composition with James Mobberley, Paul Rudy, Joao Pedro Oliveira, Daniel Asia, Chen Yi, and Zhou Long.